The University of Nottingham, and Senior Fellow at the Higher Education Academy. Her research and teaching interests focus on Islam, nationalism, identity, foreign policy analysis and postcolonial politics, with particular reference to the Middle East, North Africa, Eurasia and Turkey. Dr Göl has previously worked as a lecturer at LSE, and as both a Senior Lecturer and Reader in the Department of International Politics at Aberystwyth University. She has been a Visiting Professor at the Renmin University of China, a Visiting Scholar at the HRC Prince Alwaleed Bin Talal Centre of Islamic Studies, the University of Cambridge, and the inaugural John Vincent Visiting Fellow at the Department of International Relations, Australian National University. Dr Göl holds a PhD. from the Department of International Relations, LSE. 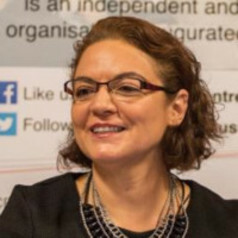 She is also the author of, Turkey Facing East: Islam, Modernity and Foreign Policy (Manchester University Press, 2013); as well as numerous articles and book chapters on Turkish nationalism, foreign policy and international politics of the Middle East.